A solid understanding of metallurgy is critical to making good decisions about metals used in products, selecting suppliers, and solving quality problems. 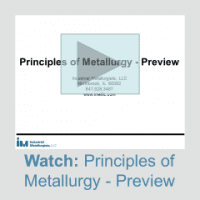 This course was designed for people who want an introduction to metallurgy or want to refresh what they learned years ago in a college course. The knowledge you’ll gain will help you understand what it takes to get the strength needed for the metals used in your products. The concepts are applicable to all alloys, with examples provided for aluminum, brass, and steel alloys. If you work with metals, having a good understanding of how metals behave and what can be done to modify a metal’s properties is critical for being more productive and profitable. Have more productive conversations with suppliers, customers, and engineers. Upon successful completion of the course you will receive a certificate for 4 credit hours (0.4 CEU’s).